Compact and light, the 32 ACP is a very popular choice for those who would keep concealed carry printing to a minimum. This cartridge by Armscor sports a 71 grain projectile, which is middle ground for the caliber and fairly common. 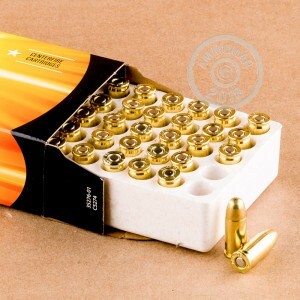 The bullet features a full metal jacket, making it ideal for lengthy sessions of training and target practice because it will stave off the rapid accumulation of lead residue that would have quickly impacted a pistol’s accuracy. This round’s 908 fps muzzle velocity falls well below supersonic speed, so you may enjoy a relatively quieter report while firing it. 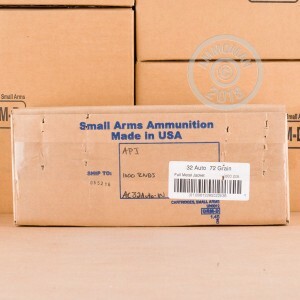 Its factory fresh brass casing and Boxer primer make it perfect for handloading, so you can keep this box in play for a nice long time. 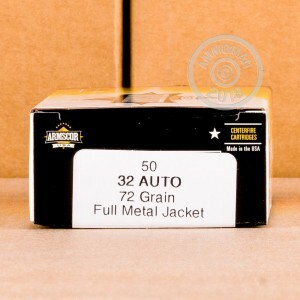 Armscor’s Precision line of ammunition is made with high quality components and to exact tolerances, so you can always count on stellar performance while firing it.